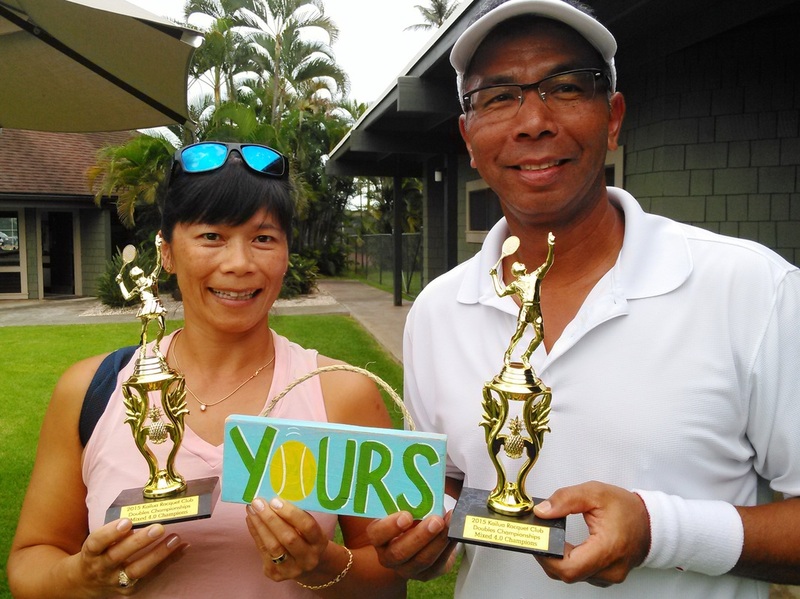 Congratulations to Tod Tanaka and Paul Botts for winning the highly competitive 4.0 Men's Doubles division in the 2015 Kailua Racquet Club Doubles Championships! Paul and Tod captured the first set 6-4 in front of dozens of wine drinking fans last Sunday afternoon. The momentum shifted in the second set with Matt and Ray winning 7-5 and jumping to a 5-1 lead in the third. But you can never count Tod and Paul out, and somehow, miraculously, they were able to mount a come-back and win the last 6 games and the match to be crowned Kailua Racquet Club's 2015 4.0 Men's Doubles Champions. Also Congratulations to Bill Blakeney and his son Conor for winning the 3.5 Men's Doubles by defeating Jim Hayes and Doug Stewart 10-8 in the third set tie-break in the finals.